The PDF (Portable Document Format) is an open standard format created by Adobe in the 90s. The format was basically designed for presenting documents which appear regular and same all across different platforms or software. But the biggest problem with the file format is that it is not open to editing, and that itself is the biggest boon as well as issue for the users as it ensures confidentiality and security of the document but does not allow to make changes at the time of need. 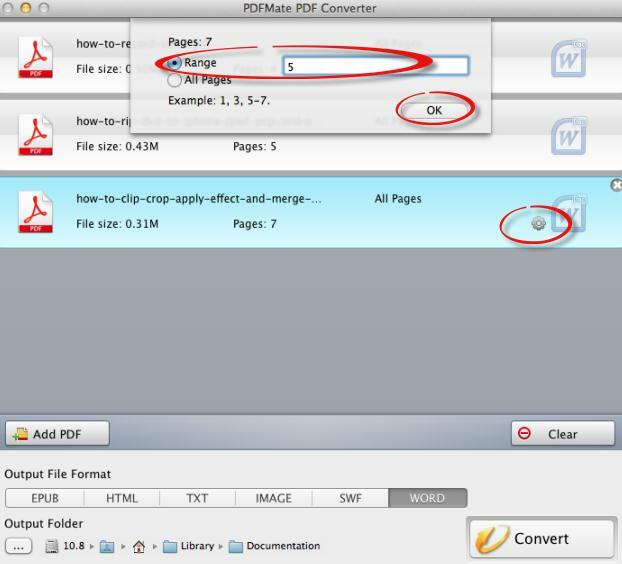 In this article, we will introduce five PDF to Word open source converter to help you solve PDF conversion problem. PDFelement ProPDFelement Pro is professional and excellent PDF to the Word converter which is quite easy to use. 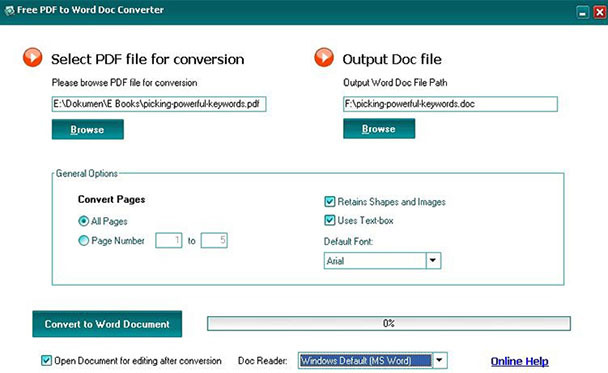 This PDF to Word converter can also help you to convert PDF to Excel, JPEG, HRML and other formats. Moreover, it can help you to edit your PDF files with powerful PDF editing tools and in an easy way. And you can markup and annotate your PDF with diversified markup tools to make your file specified. Convert PDF to Word within seconds. Scan any printed material and then change it into a digital version using the powerful OCR function on this tool. You can add your own unique digital signature to all your documents and keep your copyright. Step 1: Download and install PDFelement for Mac on your computer. Step 2: Drag and drop your PDF files to the "Convert PDF" tab in the welcome page. Step 3: Go to the "Convert" menu and select "To Word" option to start converting a PDF file to Word easily. This Hello PDF is a PDF to the Word open source converter that enables you to convert as well as edit the PDF files free of cost. This tool can export text, images, shapes from your PDF file to the Word format, without affecting the general formatting of FDF original document. The tool also has the capability to convert single files very rapidly. This individual program enables you in converting your PDF files to Word files without any necessity to install MS Word program or Any other PDF reader. You can use this tool to get fast conversion result without causing any charges. It is exactly speedy conversion and no charges at all. Quite nature in user-friendly interface. The main issue with Hello PDF is that it does not have the facility of batch conversion. The tools offered by this software have limited functionality. SmartSoft Free the PDF to Word Converter is another free open source PDF to MS Word converter software used for conversion of Adobe PDF files to Microsoft Word Doc files. This tool can efficiently convert to Word format DOC giving you the exact copy of the source PDF file. So you can use this tool to assist you to convert your PDF files to the Word document in the easy steps. It is user friendly and no charges applicable to use. It produces exact replica of the source file. 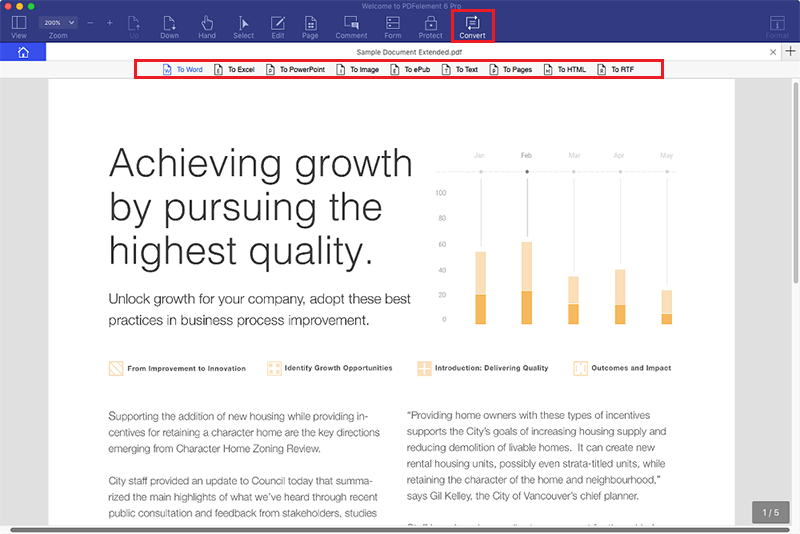 You can also search for the text to edit from the large PDF documents. Batch conversion is not possible. Additional tools are not available. 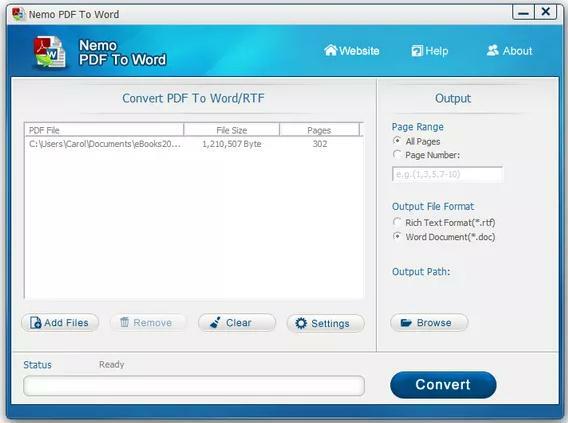 This Nemo PDF to the Word is yet another open source PDF to the Word converter software loaded with a spontaneous and user-friendly interface. 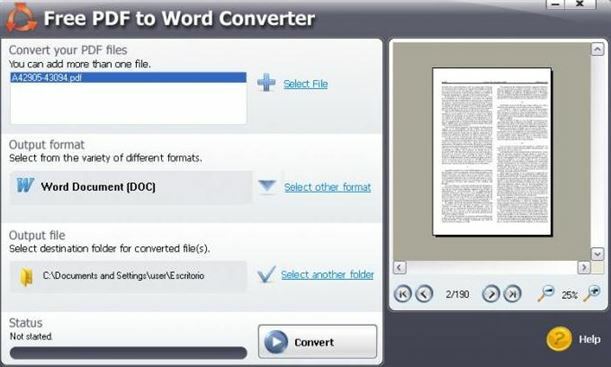 This tool offers free of charge PDF to the Word conversion. The converted document is completely editable and properly formatted MS Office Word format file. This PDF to the Word converter preserves the original text and images even after the conversion of the PDF file. The best point about this tool is that it can even convert password protected PDF files. With this PDF to the Word free converter, you can easily customize your output file and specify the location of the output Word file. You can also specify whether you wish to convert one single page or even specify the particular range of pages on the PDF file to be converted. This tool has multitasking abilities. It is free and efficient. It gives you the mode of flexible to work with Error free conversion. Add or change the background of the document. Set password protection and digital signatures on your documents. You cannot convert scanned PDF pages to Word because of lack of efficient tools. PDF Mate PDF Converter is a simple, free the PDF to the Word converter intended to convert PDF files to various other formats. This tool can carry out any type of conversion of PDF files in an easy and quick way. This converter comes with clear process flow which makes it easy to understand for the users. The program also carries out the batch conversion thus saving a lot of time and efforts in comparison to tedious task of single conversion process. Scanned PDF files can also be converted. Password settings offered for the source file. Taking screenshot of a specific area. Misleading and confusing advanced features are a big minus for the tool. The process cannot be interrupted once started.